Apple's Magic TrackPad has been given iFixit's customary teardown - and they can confirm that magical unicorns are not part of the components list. The teardown specialists discovered that Broadcom's chips are the key components, running both the touch surface and the Bluetooth connectivity. It is Broadcom chips that can be found performing similar roles in the Magic Mouse and iPad/iPhone from Apple. "We didn't find any magical unicorns inside, but we did uncover a plethora of components inside the Trackpad's *very* thin profile," said iFixit. "Even though repairing the components might be infeasible, we're still impressed by everything Apple's engineers managed to stuff into the Trackpad." One point of note is the clever way that the button is pressed by users. "The Magic Trackpad has a unique way of triggering the mouse button," adds iFixit's report.
" As you press down on the top surface of the pad, the two rubber feet near its front edge push on a plate attached to the chassis. "The plate squeezes the electronic mouse button switch, producing the characteristic 'click'." 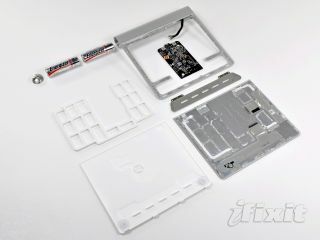 More pictures and details are at the iFixit website.